The Pilot Projects are a practical experimentation of the learning Approach MOVING - using the performing art with young at risk (NEETS in particular). A musical is a theater show where acting is integrated with songs, chorus, instrumental interludes and songs. In our project MOVING, we use three pilot projects to show how positively scenic arts and musicals may influence at-risk young people. We prove that Musicals, theater and dance contribute to self-esteem, to enthusiasm, to a sense in our life, which the young (and not only) have difficulties to find. In our society, adolescents frequently feel lost; they are not able to imagine a future. Under such conditions, it is easy to fall into emarginazion. Most of them are resigned, upset and demotivated. The 3 pilot projects are respectively in Calabria (Crotone), Liverpool - LIPA and Andalusia. 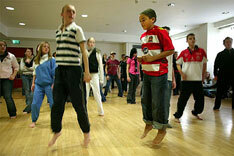 Musical Theatre and Performing arts are the vector of new possibilities for the target group. It is a way for the young people at risk to break their anger, to give a meaning to their life, a life that for most of them has no longer a meaning. In the implementation phase, youth creativity is immediately stimulated: starting point for the learning process and the improvement of skills and competences. Key outcome: the main goal is to develop a flexible learning tool focused on performing arts training so as to reduce the number of NEETS (Young people not in education, employment or training) and to transfer them from exclusion to inclusion through the acquisition of creative, social and personal competences. Prevent school dropout and juvenile unemployment.